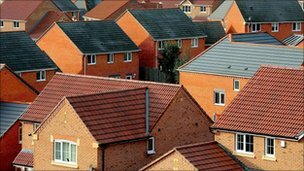 A last-ditch attempt is under way to get Leeds City Council to revise its figures for the number of houses the city is going to need over the next 15 years. Campaigners, opposition councillors and local Tory MPs say that the figure of 70,000 that the city is committing itself to in its official development plan goes against the latest official population estimates – and should be brought down to between 50 and 60 thousand. Ah, I hear you say. It’s the NIMBYs in the leafy suburbs. Keep the numbers down and they’ve got a better chance of stopping houses being built anywhere near them. If the figures are wrong, then there will be one major knock-on that could affect the whole of the city: it will almost certainly be harder to get house-builders to build on brownfield sites. Because of something called the “five year supply” rule. If the plan says 4,000 houses are going to be built every year, land has to be kept available for 20,000. The higher the target, the more land the council has to offer up for development. And the more land that’s offered up, the greater opportunity there is for house-builders to cherry pick sites where they’re guaranteed greater profits. Which will they choose – the brownfield sites in the inner city that have been mothballed because they don’t believe they’re “economically viable”, or greenfield sites in the suburbs and villages that will keep their profits booming? After years of preparatory work – including months of public enquiry – the council is set to endorse the 70,000 figure when it formally approves its long-term development plan (covering the years up to 2028) on Wednesday. The figures – and the way they’ve been arrived at – are being challenged on the previous day at a meeting of one of the council’s watchdog scrutiny committees. So, are the figures wrong? Predicting the need for housing is notoriously difficult. There are any number of models the experts use to come up with their forecasts (14, yes 14, in this report that helped inform the Leeds plan): migration, projected growth in jobs, number of new households that they think will be set up, and population, to name just four. The Leeds forecast is now being queried mostly because it turns out that, according to official projections released in May this year, the city’s population is going to be growing much more slowly (and from a smaller base) than the experts thought when they came up with the 70,000 target. According to those doing the querying, there’ll be 62,700 fewer people living in Leeds in 2028 than was originally thought. Ah, say the council and the inspector who ran the public enquiry, our target isn’t based solely on population growth, but on the predicted number of jobs there are going to be in the city – and the latest forecast is that the local economy is going to remain on the up. But there are doubts over that approach too. 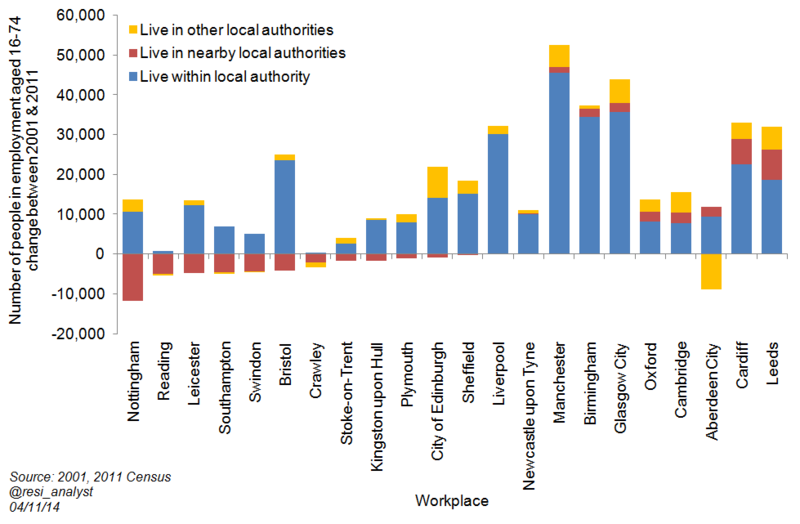 An analysis released this week shows that Leeds is bucking the national trend, with more people commuting into the city from other local authorities than anywhere else in the country. And those commuters don’t need houses in Leeds, but in the local authorities where they’re starting their cars or jumping on to one of Mr Clegg’s decrepit cattle-trucks. The committee at which the challenge is going to be heard on Tuesday is supposed to keep a close watch on all this stuff. But campaigners are concerned that the committee may not have been following up its own recommendations about how the council comes up with its housing growth forecast. Pulling the plan so it can be reconsidered at this late stage would be a major headache and embarrassment for the council, who say they’ll keep an eye on the population forecasts, but the plan needs approving NOW. Not pulling it for a re-think could condemn all those brownfield sites in the inner city to remain undeveloped for many more years to come. This entry was posted in Uncategorized and tagged 000, 70, brownfield, housebuilders, housing target, leeds, leeds city council. Bookmark the permalink. Sound like a bit of Nimby yourself citizen – green belts were always about confining working class to the foul air of the industrial inner city/brownfield site. But what kind housing will get built in either place? Tenure is the issue not numbers. You’re right. Tenure and affordability are massive issues. Maybe I should have brought that in, but it was a long and boring enough story without that. I was trying to write about the soundness of the figures in the development plan that’s being passed next week and how the availability of land influences the behaviour of the private builders that the council is going to be relying on to meet its targets. Pretty much everyone (including the council) sees greater benefit in building on brownfield land. It’s no big deal, but if the builders can’t cherry pick the green field sites (because there’s less land available) and want to maintain turnover, maybe they’ll be forced to look again at the land-banked brownfield sites, build for cheaper (and for rent?) and accept a lower profit margin. Maybe. I totally admit that, apart from S106 payments, none of this will probably have a significant effect on the fact that there is precious little housing around to rent (privately or from the state) that many people can afford. The last time I looked we’re still losing more social housing in Leeds every year than we’re creating, despite the council embarking on any number of schemes recently to increase the stock. I don’t see how the development plan is going to help redress that imbalance by encouraging smart estates in the suburbs as a result of an over-estimation of the housing need. I would like to inform your readers that Affordability of housing was and remains a key issue for the Council. 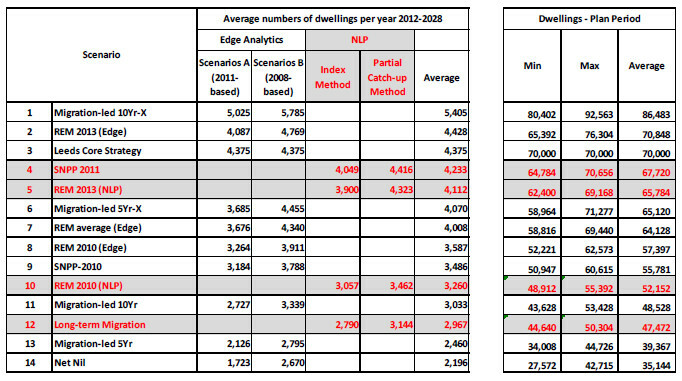 The evidence is that 1558 affordable homes are required each year to address the “need”. Affordability is based on disposable income and whether it is rented or owned property is a problem. The major house builders are not interested in building affordable homes in the urban area and have fought vigorously to reduce the numbers they are obliged to build on Greenfield sites. Some of the regeneration sites have stalled, while with funding from other income streams Holbeck, Beeston and Little London could see new development in the near future. The evidence is, the need for affordable homes is in the “urban area- Why – because transport education and health infrastructure is already in place. Tenure- evidence advises us that smaller two and three bed homes are required yet the house builders choose to maximise their profits by building larger homes and yes on greenfield sites. 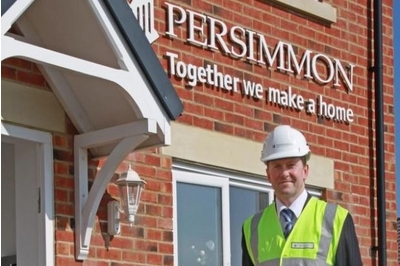 There are a vast number of sites for which the house builders have planning permission yet they choose not to build on these saying that they are no longer viable – what that means is that they do not maximise their profit. Goerge, the food argument is spurious. There are hundreds of thousands of hectares devoted to non-food uses in this country. At least as much land is devoted to horses and golf courses as housing, and this produces no food (apart from the odd horse burger). Moreover, we are not a peasant economy, there are many rich countries in the world that quite happily import food. I do not want to get into macro economics or our financial deficit .GB is already not self sufficient in food production and we are not even ,listed in the top ten producers. The British Isles is a small island are you suggesting that we become reliant on imports? As previously indicated, some of us although not all,also value green space and the amenity it brings. You have your view and I have no difficulty hearing or disagreeing with what you have to say, I am a community planner and my focus is on “Sustainable” development which does not compromise the needs of future generations . Many thanks to everyone who has already responded.